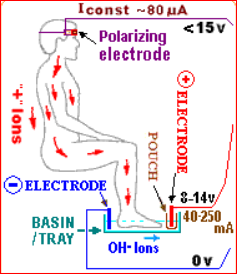 The 160X Ionic Foot Bath sends positively charged ions throughout the body. The ions attach to negatively charged toxins, neutralizing and discarding them through over 2,000 pores in the feet or hands. Our Ion Bath is 160 times stronger than the usual detox baths available. Detoxifying baths may boost the immune system, increase energy levels, relieve allergies, and purge the body of heavy metals, cleansing, activating and rejuvenating the entire body and mind. After having an ionic foot cleanse you may experience reduced inflammation, significant pain relief, less fluid retention, better memory, and improved sleep patterns. Allergy, Asthma, Arthritis, Atherosclerosis, High Blood pressure, Bronchitis, Digestive & Urinary issues, Diabetes, Chronic Fatigue, Emphysema, Epilepsy, Gangrene, Hepatitis, Inflammation, Migraine, Mycoses, Osteoporosis, Rheumatism, Alzheimer's, Parkinson's, Lyme and Heart Diseases, many Cancers, HIV/AIDS, Leukemia, Poliomyelitis, Psoriasis, Schizophrenia, Tuberculosis, Tumors, Varicose Veins and many others. Several bath sessions every few hours can strongly reduce influenza or other infection. It can be a substantial part of an alternative method to Hemodialysis, some surgeries and other dangerous invasive treatments. The flux from negative, not chemically active ions excites compensating positive ion flux inside the body. Via osmosis, through the skin pores, by the blood, lymph and other means, positive ions recombine with the excessive negative ions in the water. The electrical pulses destroy and modify viruses and microbes, regular and subtle toxins and metabolic wastes. Since many of the toxic and harmful substances in the human body are in the form of positive ions, this process leads to regaining health. This process can partially be explained by Roderick MacKinnon's discovery of the Ion channels in the cell membranes (Nobel Prize in chemistry, 2003). A small positive voltage, applied via a polarizing electrode, placed on the forehead, amplifies and accelerates the process, pushing positive ions toward the basin. 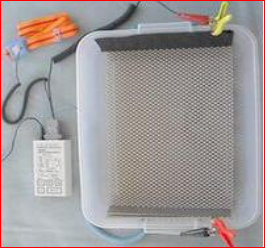 To be completely safe, without any harm to the body, a constant current generator 50-100 uA is used. It ensures an optimized adaptive voltage, independent of the pulses, skin condition, body movement, electrode quality, etc. As is well known in the wise Traditional Eastern Medicine, the feet and palms of the hands are linked to all main organs, via special neuro-info channels, through which the electric pulses from the Ion Detox stimulate the entire body resulting in improved body function.